The Odyssey is an epic, ancient Greek poem by Homer. It chronicles the long and arduous journey of Odysseus as he makes his way home to his wife, after the fall of Troy. While this slot game might not have an ancient Greek theme, it certainly is epic! In this odyssey, Novomatic takes you into space. The reels are suspended amongst the stars. There are four reels and 13 paylines in this game. Some pay from left to right and others pay from right to left. There’s a special feature in this game, consisting of locking reels and Wild action! You can also win Free Games in Crystal Odyssey! All of the symbols are crystals – of all different colours and shapes! Some of them are incredibly valuable, whereas others don’t pay much. This is a great game for relative beginners, the only thing that’s a bit more complicated than the simplest of slots is the payline situation. Normally, paylines only play from left to right but these paylines are a little more complicated and they’re different for x3 wins and x4 wins. There are loads and loads of great games for beginners for Novomatic. Check out these Novomatic slots: Amazing Stars, Diamonds of Fortune, Sparkling Gems and Gemstone Jackpot. There are 7 different crystals in Crystal Odyssey. The difference between the least valuable crystal and the most valuable is massive! The green emerald and the purple amethyst only pay up to 4x your bet. The yellow sapphire and the red ruby can pay up to x8 your bet. The blue sapphire pays up to x20 your bet. The amber crystal gives payouts of up to x40. In contrast, the diamond (which is by far the most valuable symbol on the reels) gives wins of up to a whopping x500 your bet! All of these payouts are for x4 matches, for which there are three paylines that run horizontally across the reels. The gemstones all have payouts for three matches, too. These can be given when symbols land consecutively on the first 10 paylines. 5 of these paylines run across the reels from left to right and the other 5 run across the reels from right to left. The paytable shows these paylines in detail so you can check here if you’re unsure. The paytable also details all the rules and the payouts. 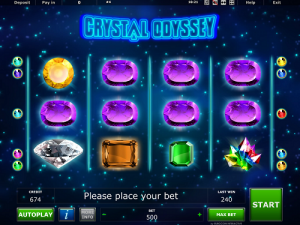 Crystal Odyssey isn’t just a normal slot game. The Crystal Wild and the Crystal Odyssey Scatter. The Crystal Wild is a multicoloured crystal that looks like it could have been made somewhere in space! This symbol, as is usual for a slot Wild, can behave like a substitute for any of the other symbols. If the Wild lands in a position where it can contribute to a win, it will stand in and get you the payout. It can’t substitute for the Scatter symbol. The Wild symbol also has the power to lock the reels! It only shows up on the rightmost reel (reel 4). When it lands but doesn’t contribute to a winning set of symbols, it will lock the reel into place. The other reels will spin for free to give you a second chance at getting a win! The Crystal Odyssey Scatter symbol doesn’t give payouts but it does give Free Games! 3x Scatters = 10 Free Games. 4x Scatters = 20 Free Games. The whole 4th reel (the rightmost reel) will be covered in Wild symbols throughout the Free Games. It also gains the ability to substitute for the Scatter symbol, which means you’ll only need to spin one or two to re-trigger more Free Games. You can get up to a maximum of 300 in one go! The RTP for Crystal Odyssey is 95%. That’s on the low-side for a slot game but Novomatic players know that their games can really pay out.